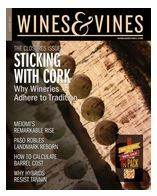 The August 2015 issue of Wines & Vines magazine is full of interesting and useful information as usual. One article that caught my eye provides IRI off-premise wine sales data for the top 20 U.S. wine brands. What are the best-selling off-premise brands? What’s hot (and what’s not)? Sutter Home from Trinchero Family Estates is #2, but a long way back at $356 million sales. The rule does apply here — value is down 2% on the year and volume is down 3%. The Wine Group’s Franzia Box is just behind with $325 million in sales on the year, flat in value terms and down 5% in volume. Franzia’s average price per 750 ml equivalent is up 11 cents to $2.17 compared with Sutter Home’s $5.25. Who are the other big players? Here are the remaining members of the top ten listed in order: #4 Woodbridge by Robert Mondavi (Cons tellation), #5 Yellow Tail, #6 Kendall Jackson, #7 Beringer (Treasury), #8 Chateau Ste Michelle, #9 Cupcake (The Wine Group), and #10 Mènage à Trois (Trinchero). The next ten largest brands includes four Gallo product lines (Gallo Family Vineyards, Apothic, Carlo Rossi and Livingston Cellars), four from Constellation Brands (Black Box, Clos Du Bois, Robert Mondavi Private Selection and Rex Goliath) plus 14 Hands from Ste Michelle and Bogle Vineyards. Clearly the Big Three companies (Gallo, Constellation and The Wine Group) dominate the list, but note how Trinchero and Ste Michelle punch above their weight. Kudos to Bogle for their success, too. The biggest wine brands are not always the hottest brands and the IRI data reported in Wines & Vines bears this out. As noted above, many of the top brands are experiencing slower sales in value terms including Sutter Home (-2%), Yellow Tail (-5%), Gallo Family Vineyards (-2%), Carlo Rossi (-3%), Clos Du Bois (-2%), Mondavi Private Selection (-4%), Livingston Cellars (-5%) and Rex Goliath (-4%). These declines are matched by some spectacular gains elsewhere on the wine wall, often at much higher price points. Mènage à Trois tops the Hot List with 24% growth in value and 23% increase in volume, continuing its incredible market run. Black Box is right behind with 23% value growth. Gallo’s Apothic is next 21% value growth. Continuing down the Hot List (among the 20 largest brands) is 14 Hands (+17%), Bogle (+15%) and Chateau Ste Michelle (12% value growth). When you’re hot you’re hot, I guess. While Beringer and Clos Du Bois have experienced falling average prices according to IRI (-11 cents per bottle equivalent for Beringer and -27 cents for Clos Du Bois), Mènage à Trois has seen its average price rise by 10 cents while Apothic’s average price holds steady at $9.58. Remember that these are data for off-premise sales only and all data sources have limitations, so draw conclusions cautiously. Thanks to Wines & Vines for publishing this interesting snapshot of the U.S. wine market in transition. What will the final picture look like? Stay tuned to find out. Interesting indeed. Just about every heritage brand that I “grew up” with in the business is now owned by somebody else. I’m sure you’ve seen the University of Michigan wine brand graphic – it shows which brands are owned by which mega-supplier. I’m working for San Antonio Winery, the Riboli Family, here in Los Angeles. The family owns Stella Rosa, which is one of the fastest-growing imported wine brands. Talk about selling to a non-wine drinking demographic…….